This is the first in what I plan to be a series of conversations with other professionals in the wedding industry. I want to talk with vendors of all kinds, even other photographers, to help you gain some insight into the wedding industry and what kinds of things to think about and ask as you start to meet with vendors for your wedding. We start off with a good buddy of mine, photographer Michael A. Anderson. If you live anywhere near Concord, NC, you've probably seen this guy's face or at the very least, his hat. 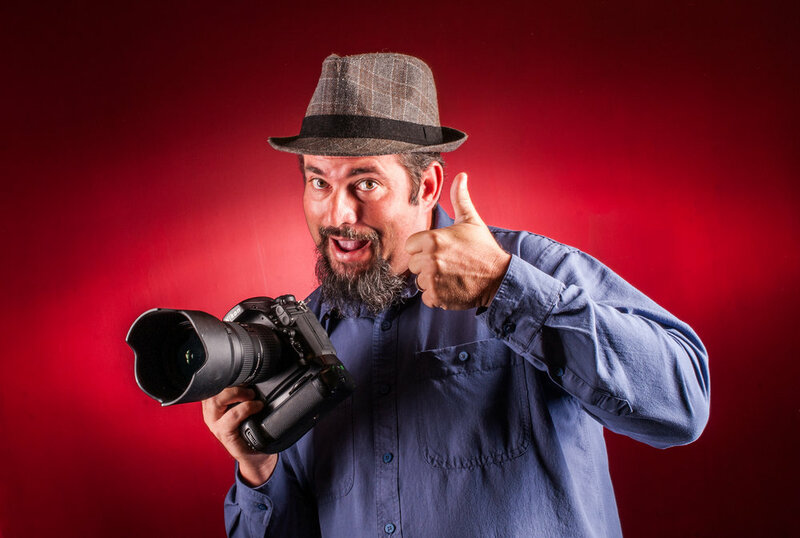 He is fun loving and makes some pretty stunning images for his clients. He and I have very different styles of shooting, but both have a passion for telling stories with our photos and I always love talking with him about photography. Here is our conversation over hot wings at the Carolina Ale House. James: Give me your general philosophy behind wedding photography. There are a lot of different things you shoot, why do you like to shoot weddings? Mike: It’s challenging from a photography point of view. It’s one of the hardest things, I think, there is to shoot. Wartime photography, sports photography and wedding photography … those are all in the moment, as it happens type shooting. You’ve got to be good at what you do to be able to capture that. I love being able to share moments with people. It’s a moment that is special to not only one or two people, but entire families. To be able to share that moment with them, I love. You can have a 100 weddings in the same place with the same color schemes, but everyone one of them will be distinctively different because it’s about the people. Sometimes brides, and even other photographers, get caught up in all the details. It’s not all about the details. Although you do want the details. It’s about the people. James: I agree fully, you can have everything else be the same, but it’s the people and the moments between those people that make a wedding special. It’s always going to to be different. I got married myself last year, and I think that experience changed my perspective some. Before, I thought weddings were fun to shoot because I’m a photojournalist and weddings are full of moments. I really realized how incredibly meaningful it is to have quality photography done at your wedding. Going into my wedding I was thinking "of course it’s important" because I shoot weddings. Having those photos and looking back now, I think I underestimated how meaningful it would be to me to have them. Not only me, but my whole family. Mike: What I tell people is when you leave a wedding, you’re leaving with two things. Your rings and your pictures. The food is gone, the cake is gone, the table settings are gone. If you don’t have quality photography to capture your day, what’s the point of making everything nice and special. Chances are you won’t remember all of it. When you break down the wedding, the venue is first. It sets the tone for the type of wedding you are going to have. Photographers are the next most important thing aside from the minister or officiant. J: Without them, you’re not getting married. M: Then it’s just a party. I think you going through it on the otherside helps you realize the importance in the value of photography. Actually being the client you see how fast the day goes by, people don’t realize this. J: Let's talk about hiring a photographer. One of the things I find, especially early on in the process for newly-engaged couples, they don’t really know what they are looking for because this is the first time they’ve hired a professional photographer or the first time they’ve hired a professional DJ or had a massive cake made special for them. M: There are so many people who shoot now, who want to call themselves photographers. Even if you don’t book with me, book with someone who you love their style. Don’t go to someone who shoots all natural light photography and ask them to do stuff with strobes. Don’t say ‘I want rustic’ and hire someone who only shoots in black and white. You need to put some research in to it before hiring a photographer. J: Same thing goes for everything else. If you really want a church wedding, why get married in a barn. If you’re not religious, why are you getting married at the church. M: You’re not going to go to the cake lady and ask her to make doughnuts. You hire people to do what they do best. Weddings are fast and furious and they are never perfect. You want to make sure the people you hire know what they are doing and can adjust and adapt. There are so many good professionals out there. Pick the person you like and the style to fits you. J: I encourage everyone who talks to me to make sure they have done their homework. I’ll tell them, at the end of our consultation, to meet with other photographers. I want them to do their research. I want to make sure that I am right for you. I want to make sure it is a good match. We will be together all day long. If I am not the photographer you connect with or relate to, then it might not be the best match. M: Totally agree, we spend more time with the clients than anybody, including any family member. Just like you, I tell people to go to talk to others as well. If you’re not comfortable with your photographer, if you don’t trust them, it’s going to show up in your pictures, in your eyes, in your body posture. I don’t care how good of a photographer you get, if you don’t like them, you’ll notice it in your pictures and so will other people. Photography goes back to the value you put on it. If you don’t value photography that much, you’re not going to spend that much. J: And that’s not a problem, not everyone needs to value photography. M: I totally agree, but you are going to get what you pay for. Everyone has a choice. My clients value what I do. There is a lot of work that goes into it. We are the only people, that at the end of the reception is over, and the couple is gone, we’re still working. J: We still have editing to do and albums to design. M: We have to be, problem solving is as important in photography as creativity is. J: I love it when can help assist the bride in some way, even if it is just wrangling family members together. That takes stress off of them and helps them enjoy the day a little bit more. M: It can get stressful really fast and you’ve got to keep people calm, cool and collected. It will show up in the images. J: Exactly. I don’t want my clients to look back at their photos and think about being stressed. I want them to see and remember the happiness that they felt. One last thing, because I know this happened to you recently. Tell me about when you look at the back of your camera and see an image you just took that blows your mind. You know they are going to love it and everyone will love. What goes through you mind then. M: Sure, sometimes when I’m shooting, I think I get more excited about the images than the couple does. I don’t want it just to be good enough, I want it to be the best that I can do. I’m going for years down the road and I want people to look at an image and either be able to laugh, cry or smile. I want it to stir some kind of emotion years down the road. To know I got that, the second I clicked the shutter, gives me goosebumps. When you get that, you know you’ve got something for these people, their friends, their family they can enjoy the rest of their lives. J: Ultimately, that image is what they will see on their wall or on their album cover, or even on their phones. That’s going to excite an emotion each and every time. That’s amazing. M: Part of really good photography is being prepared to be lucky. J: Exactly, luck is what happens to those who are most prepared. M: Sure, you’ve got to be prepared. The more you do, the more you anticipate things happening. I’ve seen the looks and I know what will possibly happen. When I get that, it warms my heart because I know I just created a memory that will last not only in their lifetime, but their children’s lifetime. It's like you’re a history teller. J: Coming from the newspaper world, I think that’s what I love about this. In photojournalism, there is a saying about being on the sidelines of history. What get’s me so excited about wedding photography is it’s a personal history and creating these memories that I know will be so important to these people … I love it.